Sneaky Pete’s, Moody AL – Marie, Let's Eat! The detour to Amory really was a big one. Even outside the time spent at the two restaurants, it added more than an hour to the drive, as we rolled lazily along US-278 through the small Alabama towns of Sulligent and Guin before rejoining I-22. The connection between I-22 and I-65 is still not quite complete, but it felt like they have done some work repaving those streets that connect the two – Coalburg and Daniel Payne – because I certainly remembered those roads being very, very well traveled and *full* of potholes, but they’re not bad now. 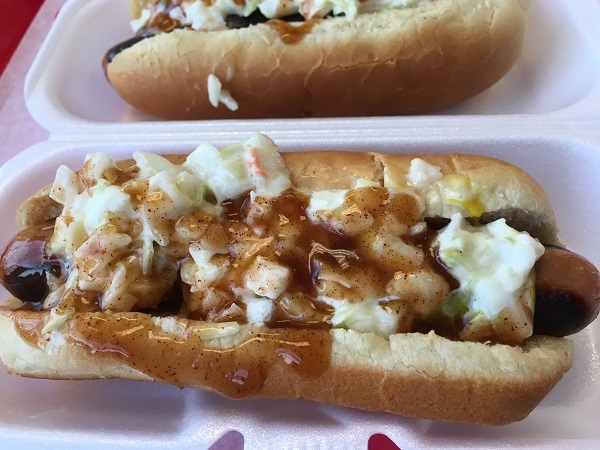 Since we were going through Birmingham, I wanted to stop and visit one of the sixty-eleven hot dog shops in town, and this time elected to give Sneaky Pete’s a try. This is a chain with at least thirty locations around Alabama, and one in Mississippi, which Pete Graphos first opened fifty years ago in 1966. Pete originally worked alongside his brothers at his father’s place, Lyric, which closed a couple of years ago after a run of 57 years. According to the sadly dormant Great Birmingham Hot Dog Tour, Pete’s brothers opened two other hot dog places, Sam’s Super Samwiches and Jimmy’s, which are both still around. Unfortunately, Sneaky Pete’s website is just on this side of disastrous. It lists the locations, but we have learned that these do not have any consistency about when they are open. Individual franchisees make their own hours. A couple of them might be open on Sundays, but by far most are not. Quite a few others, like the one we aimed for on Park Place in downtown Birmingham, aren’t open on Saturdays either. Now, I realize that Birmingham’s downtown is hardly the most thriving city center in the southeast, but there is still plenty to do, like visit McWane or Reed’s Books, and tourists like us might want a dog. That was very frustrating. We abandoned the plan to get hot dogs and made our way east out I-20 for the town of Moody, to get some barbecue. Just after getting off the highway, my daughter spotted a Sneaky Pete’s in a strip mall on our right, and, happily, they were still open. I gave the teenager who took our orders a little playful stick about his company’s awful website, and he took it with good grace and professionalism. Good fellow. We sat down to some pretty good hot dogs, made in that old Alabama way with a really tasty red sauce over the grilled franks. If you’re unfamiliar with the style, spend fifteen minutes and enjoy the Southern Foodways Alliance documentary Hot Dog-opolis, which is about the history of Birmingham hot dogs, as sold by Greek immigrants. At 9:30, you’ll see a brief rundown of some of the ingredients that you’ll probably find in these sauces, and these will include vinegar, ketchup, onions, pepper, oregano, paprika, chili powder, and water, among other things. 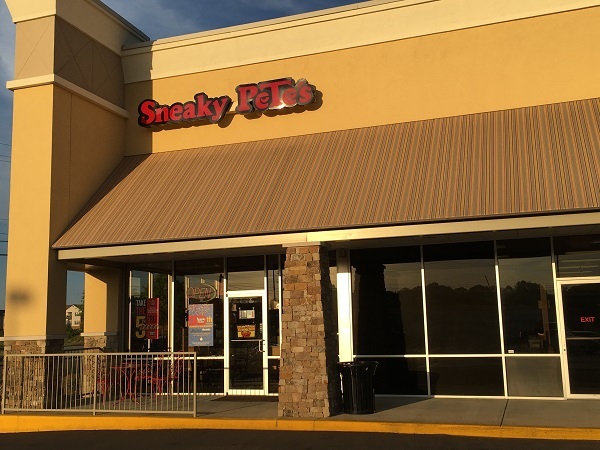 Sneaky Pete’s sells their sauce on their website and pours it over just about every one of their messy dogs, whether you order a slaw dog or their original, which comes with seasoned ground beef and kraut. It’s a winning combination on any hot dog, and heaven knows this place sells plenty of varieties of them. You can get them here with chili, cheese, bacon, peppers, all kinds of concoctions, and with that great sauce on top. 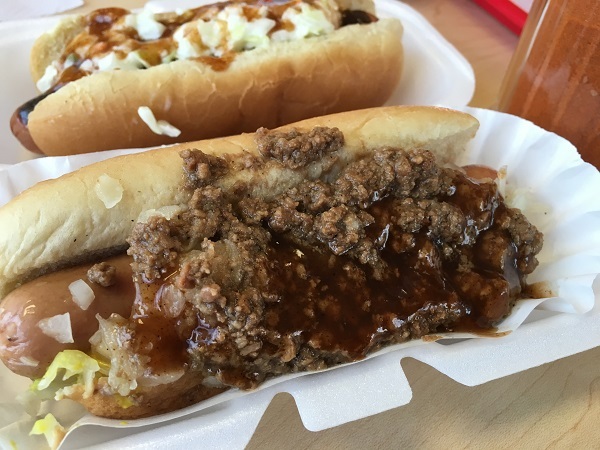 Looking far back in our blog, I see that more than six years ago, I proposed making a day trip to Birmingham and spending the daylight hours eating hot dogs. We never did that, but we might think about doing something a little similar sometime next year. We really have never given the Magic City the attention it deserved at this blog and we should rectify that. Perhaps we’ll try to come on a weekday, when more of the barbecue and hot dog places are actually open for business. Posted on July 20, 2016 by Grant G.Posted in alabama, birmingham, hot dogs, local chainsTagged alabama, birmingham, hot dogs, local chains, moody. Sneaky Pete’s has been a favorite for years. We don’t get to Birmingham too much but we usually find time for a dog there. I didn’t know it was related to Lyric. I do hope we can get back to Birmingham later this year or in early 2017. Stay tuned! Great review on Sneaky Pete’s restaurant. Reading it makes me want to go there. The food looks great.